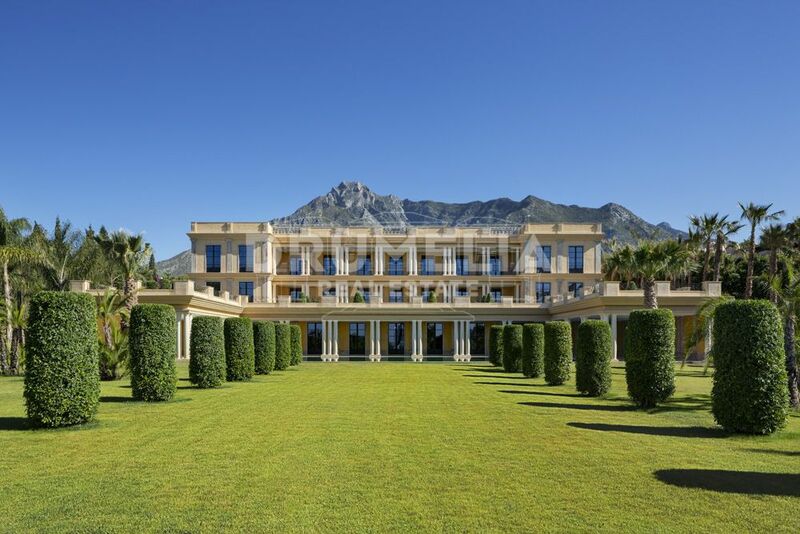 Interested in a property that belongs to an international elite of homes? 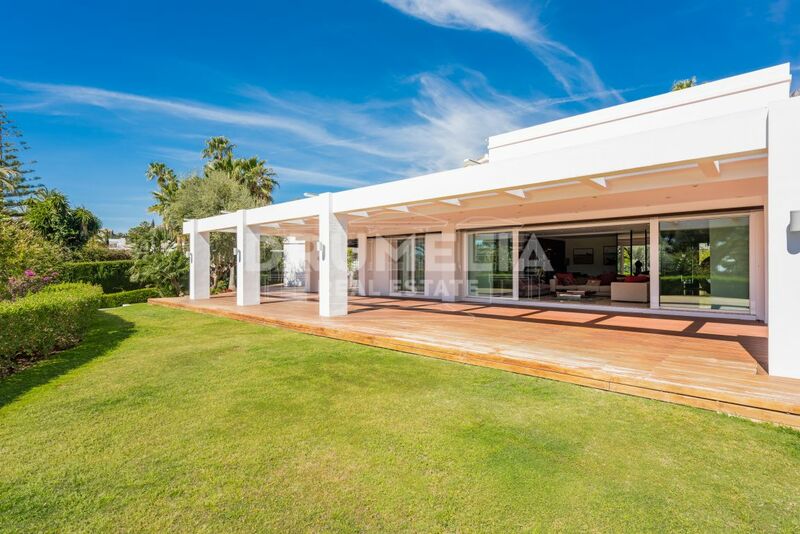 Don’t miss this unique villa with captivating elegance, modern aesthetic and practical appeal that brings a new standard of architectural refinement and creative excellence to Marbella. Ensconced among natural greenery in the foothills of the Sierra Blanca and overlooking the Mediterranean and 2 continents, the architectural jewel has been designed by Madrid-based architect, Spain’s leading designer of luxury villas for the likes of Penelope Cruz, Javier Bardem and Cristiano Ronaldo. Superb contemporary property of rare sophistication, with 21st century technology and engineering, is also a true family home with rooms that are spacious, modern and impressive yet classy elegant, cosy and inviting. No wonder it has the name ‘El Nido’ (Nest)! 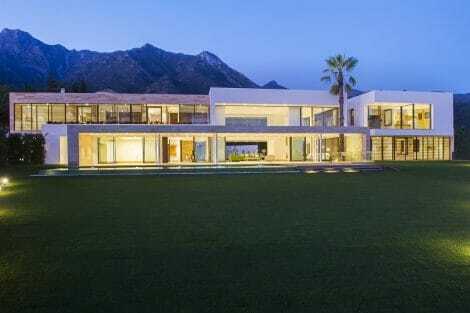 Grand villa of 3.152 m² draws the eye with innovative design, elegant geometric lines and subtle visual detail without ever becoming superfluous. Designer’s artful manipulation of space and light produces a seamless flow of living spaces and a free-flowing open distribution. Modern technology controls everything, from lighting and audio-visual systems to access and a whole range of advanced home automation systems. Bright splashes and golden accent pieces add a luxe touch to fashionable contemporary colour palette; collected art and decorative items bring glamour and chic; eclectic mix of natural materials, leather, glass and metallic elements offers a captivating contrast. Lighting globes are designed by Tom Dixon whose works have been acquired by museums across the globe, including Victoria and Albert Museum, London, Museum of Modern Art, New York, and Centre Georges Pompidou, Paris. The very finest eco-friendly materials and styling have been employed throughout, in living and home entertainment areas: dining room with made-to-measure furniture, 8 en-suite bedrooms each offering its own style, sleek, minimalist Poggenpohl kitchen, impressive private studies, separate guest apartment, modern glass wine cellar which is a design feature in its own right, and magnificent SPA enjoying natural light, with indoor pool, wet bar, sauna, steam bath, cold bath, gym and beauty salon. 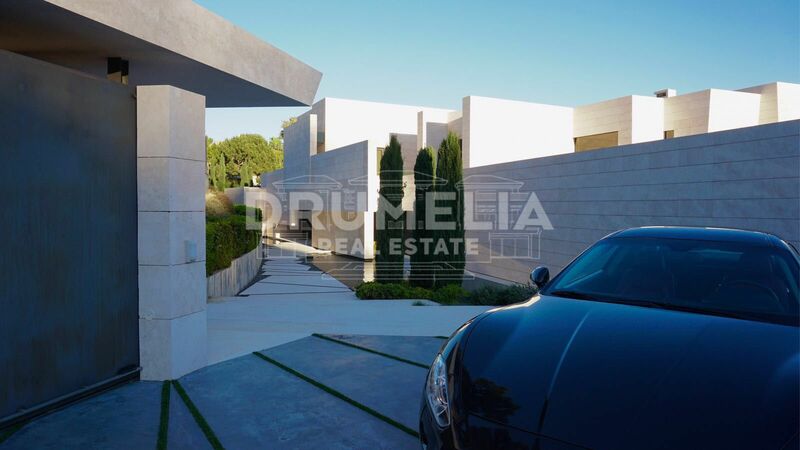 Spacious multi-car garage has a glass wall that allows to showcase your collector cars. 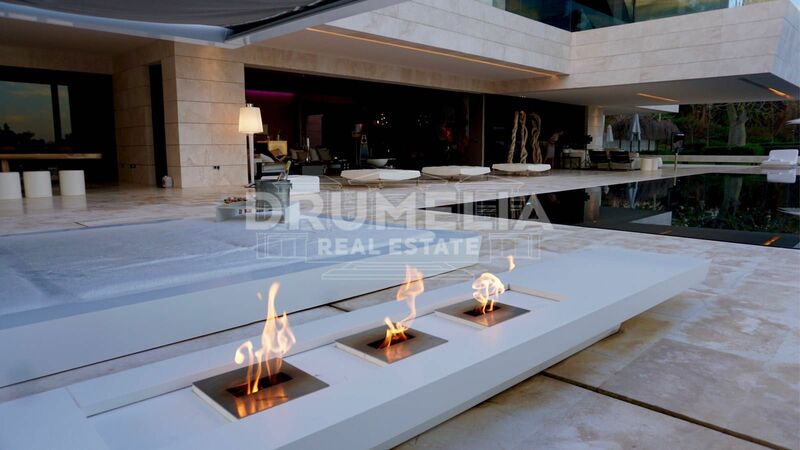 Indoor refinement is seamlessly continued outdoors, where stylish terrace area features a cosy chill out zone with bio fireplace, sophisticated lounges, al fresco dining area. Everything on a generous plot of 6.466 m² speaks of style, from manicured gardens and architecturally styled dog kennel to championship tennis course, imposing pool and the designer catering kitchen that serves a large dining table surrounded by artwork – an ‘urban forest’ by Rafael Llamazares. It is already clear that this is a very special place characterised by exceptional art. But there’s much more! Work of art itself, this home is built around the Work of Art, which one day may well be worth more than the villa itself. ‘The Pulse’ is the 15-metre steel structure, the red heart around which the house was designed. It forms the imposing focal point and indeed visual connection between different parts of home. The sculpture is created by Arne Quinze, a leading Belgian conceptual artist who made installations for Louis Vuitton and revealed a virtual installation on the Statue of Liberty in New York, whose Avant-garde work is displayed in the centres of Brussels, Paris, Shanghai, Beirut, in the Saatchi Gallery in London and Louisiana Museum of Modern Art. Masterpiece of modern Mediterranean architecture ‘El Nido’ suits its select residential address of Cascada de Camoján so well! 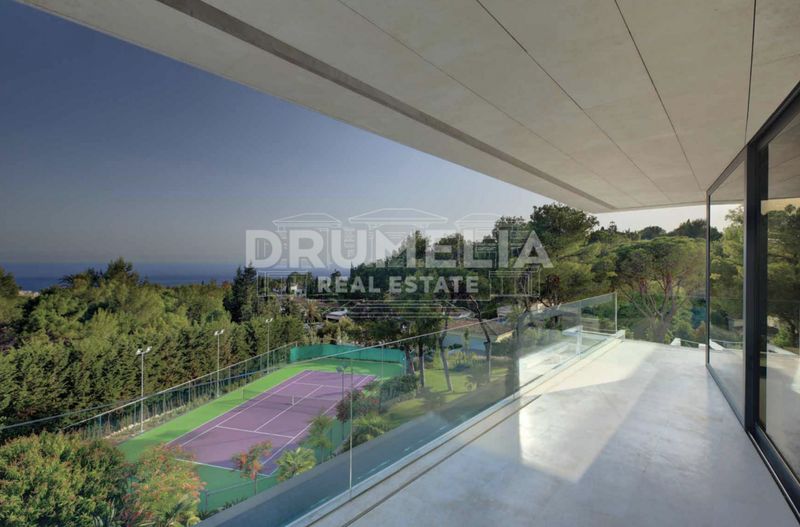 Your own tremendous world with mind-blowing views and proximity to all best amenities is ideal for contemporary luxury living in Marbella.